The next Blue Moon will be on May 21, 2016. It’s a seasonal Blue Moon, the third of four full moons between the March equinox and the June solstice of 2016. Can a moon be blue in color? There’s one kind of blue moon that is still rare. It’s very rare that you would see a blue-colored moon, although unusual sky conditions – certain-sized particles of dust or smoke – can create them. Blue-colored moons aren’t predictable. So don’t be misled by the photo above. The sorts of moons people commonly call Blue Moons aren’t usually blue. The last monthly Blue Moon happened on July 31, 2015. In recent decades, many people have begun using the name Blue Moon to describe the second full moon of a calendar month. There was a full moon on July 2, 2015. There was another full moon on July 31. So the July 31 full moon was called a Blue Moon, according to this definition. The time between one full moon and the next is close to the length of a calendar month. So the only time one month can have two full moons is when the first full moon happens in the first few days of the month. This happens every 2-3 years, so these sorts of Blue Moons come about that often. 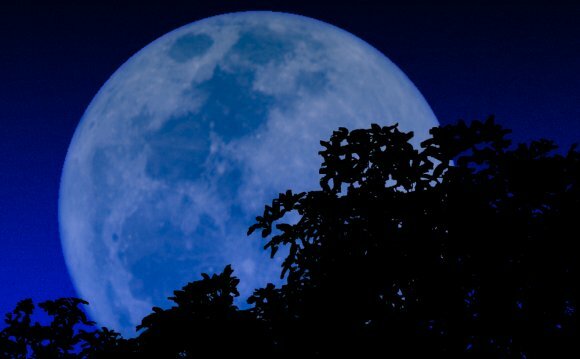 When was the last Blue Moon, according to the monthly definition? It happened on July 31, 2015. The next one will be on January 31, 2018. Seven times in 19 years there were — and still are — 13 full moons in a year. This gives 11 months with one full moon each and one with two. This second in a month, so I interpret it, was called Blue Moon. Had James Hugh Pruett looked at the actual date of the 1937 Blue Moon, he would have found that it had occurred on August 21, 1937. Also, there were only 12 full moons in 1937. You need 13 full moons in one calendar year to have two full moons in one calendar month. However, that fortuitous oversight gave birth to a new and perfectly understandable definition for Blue Moon. EarthSky’s Deborah Byrd happened upon a copy of this old 1946 issue of Sky and Telescope in the stacks of the Peridier Library at the University of Texas Astronomy Department in the late 1970s. Afterward, she began using the term Blue Moon to describe the second full moon in a calendar month on the radio. Later, this definition of Blue Moon was also popularized by a book for children by Margot McLoon-Basta and Alice Sigel, called “Kids’ World Almanac of Records and Facts, ” published in New York by World Almanac Publications, in 1985. The second-full-moon-in-a-month definition was also used in the board game Trivial Pursuit. Today, it has become part of folklore. Blue Moon as third full moon of four in a season. The Maine Farmer’s Almanac defined a Blue Moon as an extra full moon that occurred in a season. One season – winter, spring, fall, summer – typically has three full moons. If a season has four full moons, then the third full moon may be called a Blue Moon. There was a Blue Moon by this definition happened on . Another occurred on August 20-21, 2013. And the next one will occur on May 21, 2016. Which Blue Moon definition is better? In recent years, a controversy has raged – mainly among purists – about which Blue Moon definition is better. The idea of a Blue Moon as the third of four in a season may be older than the idea of a Blue Moon as the second full moon in a month. Is it better? Is one definition right and the other wrong? Opinions vary, but, remember, this is folklore. So we, the folk, get to decide. In the 21st century, both sorts of full moons have been called Blue. Old folklore it is not, but real folklore it is. The next year of double monthly blue moons is coming up in January and March, 2018 – and then, after that, in January and March, 2037. Very rarely, a monthly Blue Moon (second of two full moons in one calendar month) and a seasonal Blue Moon (third of four full moons in one season) can occur in the same calendar year. But for this to happen, you need 13 full moons in one calendar year AND 13 full moons in between successive December solstices. This will next happen in the year 2048, when a monthly Blue Moon falls on January 31, and a seasonal Blue Moon on August 23.